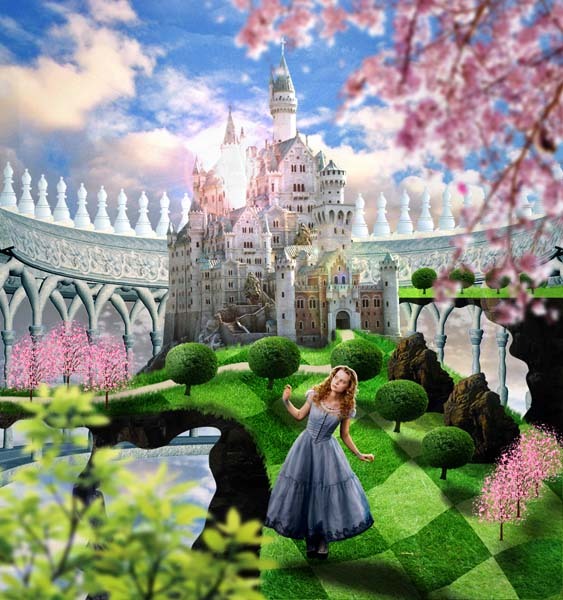 Learn how to create a beautiful fantasy castle photo manipulation inspired by the Alice in Wonderland movie. 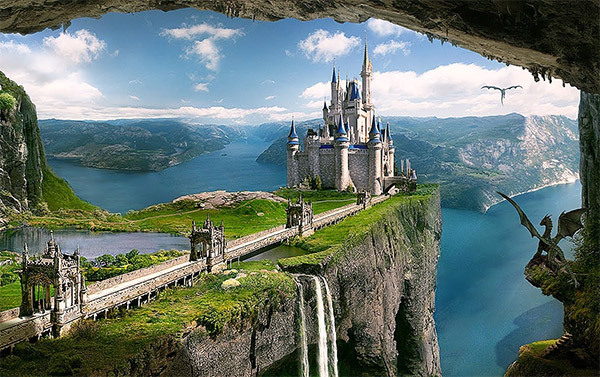 In this photo manipulation tutorial you will learn how to create a fantasy fairy tale landscape combining different stock images and using some basic Photoshop blending techniques. I really hope you will enjoy this new photo manipulation tutorial. Open a new PSD file and copy all the stock cropped images. The first layer is the Sky Clouds layer that we are going to leave just the way it is, only with the beautiful Fairy Tale Clouds stock image. You can erase the lower part of the image or you can use a layer mask to hide it. As you can see the image covers just a half of our canvas. We will have to fill the missing area in the next steps. The second layer will contain the Castle stock image. So place it in the center and crop it like shown in the image. To remove the background I have used the Pen Tool to make a selection. This is not the final castle shape, we are going to adjusted in the following steps. Here is the before and after Color Balance Adjustments. You can see that the castle tone colors match even better with the Sky color after these changes. With the help of the Pen Tool, draw the scene. There are five shapes, two for the rock, two for grass and one for the road. That way it will be very easy to texture each of these shapes. Before we begin to texture the shapes created above, let's use the Eraser Tool to delete some parts of the Castle Layer and blend it better with the new added shapes. Resize the Grass Texture and duplicate it to cover the entire grass shape area. You can use the Clone Stamp Tool to fill and fix the missing parts. Select the Grass Shapes (press CTRL and click on the Vector Mask Thumbnail) and make a layer via copy(CTRL+J) from the Grass Texture layer. Use the Burn Tool to darken the area along the road path. Use the same tool to create depth and a 3D look. Create another layer below the Grass Texture and call it Grass Brush Layer. Use a grass brush to add some grass along the grass shape edge. This grass brush is made using the predefined Grass Brush that comes with the CS3. Use different tones of green color. Use the Eyedropper Tool to find a similar color to the grass area that you are painting under. In a similar way add grass along the Road Path and other areas. Make sure you place this new Grass Layer above the Road Path Layer. You can change the size of the brush and you can use the Dodge/Burn Tools to adjust the color. In this step I will use a simple Chess pattern. Use the Perspective Tool to distort the Chess Pattern Layer like shown in the image. Set the Blend Mode of this layer to Soft Light 60%. 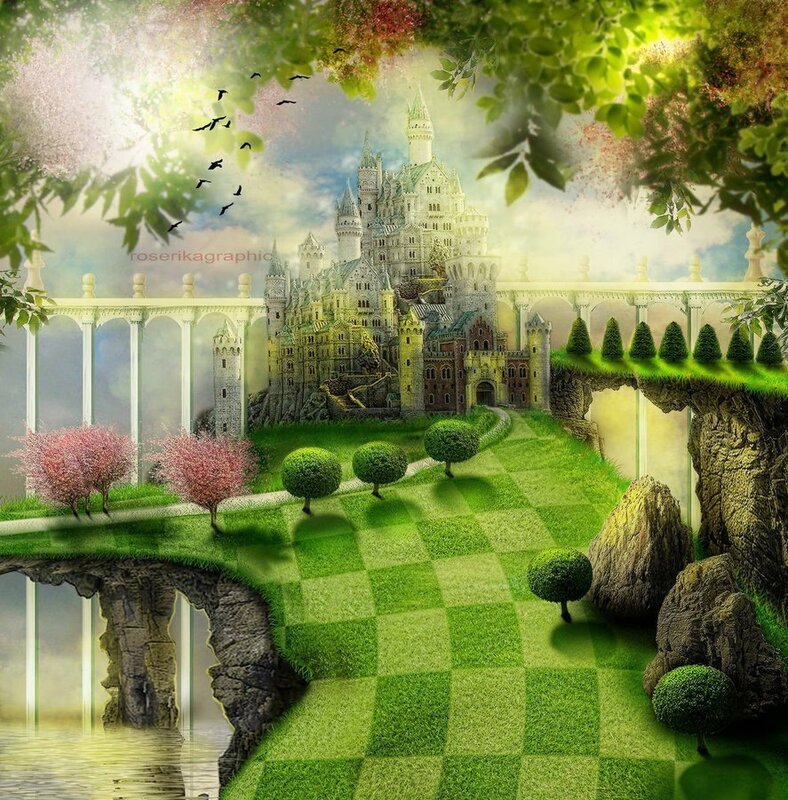 Use the Warp Tool from the Edit> Transform menu to distort the chess pattern to follow the landscape shape. Select the Chess Pattern Layer shape (press CTRL and click on the Layer Thumbnail), transform it into Work Path and Stroke Path using the Grass Brush. The color for the brush is black, 100% opacity. Select the Grass Shapes (press CTRL and click on the Vector Mask Thumbnail), expand it by 2px and add it add Layer Mask for the Chess Pattern Layer. Make sure you place the Chess Pattern below the Road Layer. Adjust the Grass Brush Layer using the Burn Tool so that all the layers added so far blend well one with another. For the Road Layer choose #dcceb5 as color and rasterize it. Use the Smudge Tool to integrate to road with the grass. Use the Eraser Tool to delete some areas from this texture and to model it after the Rock Shape. You will have to duplicate some areas and blend them together to obtain a realistic stone structure. Whenever is necessary use the Clone Stamp Tool to add missing areas from different parts of the Little Island rock texture. For the Rock Structure from the right side of the image you have to resize the texture and use the method from the previous step. Don't forget to also use the Transform/Rotate Tool to obtain different rocks. Using the Little Island stock image and the Rock 1 Stock image add two rocks like in the image. Resize and adjust the color of the two rocks. Use the Eraser Tool to adjust the shapes of the two rocks. You can even use a Gradient Overlay(Soft Light 85%) with a transparent black(100%) to black(0%) gradient map, so that the lower part of the rock to become darker. The idea is to blend all the pieces together as good as possible. I will now use these tree PNG stock image to add several trees around the landscape. Duplicate and resize the trees like shown in the image. Use another garden trees stock image to crop some trees and place them on different spots. Use the Burn Tool and the Dodge Tool to create shading and lighting for each tree according with the light source. Reduce opacity for the shadows and also add a Gaussian Blur effect. I want to make the castle taller and look more impressive; for that I will make a selection from the initial castle image and simply make a Layer via Copy. Place the castle selection behind the initial Castle layer; also darken the bottom area using a Gradient Overlay with Soft Light blend mode. Use this Bridge Paris stock image, use a Selection Tool and simply remove the background. Resize/rotate/transform the bridge and place it like shown in the image. To make the bridge taller simply make a selection like in the image and use the Transform Tool to add height. Duplicate the Bridge Layer with the Adjustment Layers and place them one near the other like shown in the image. 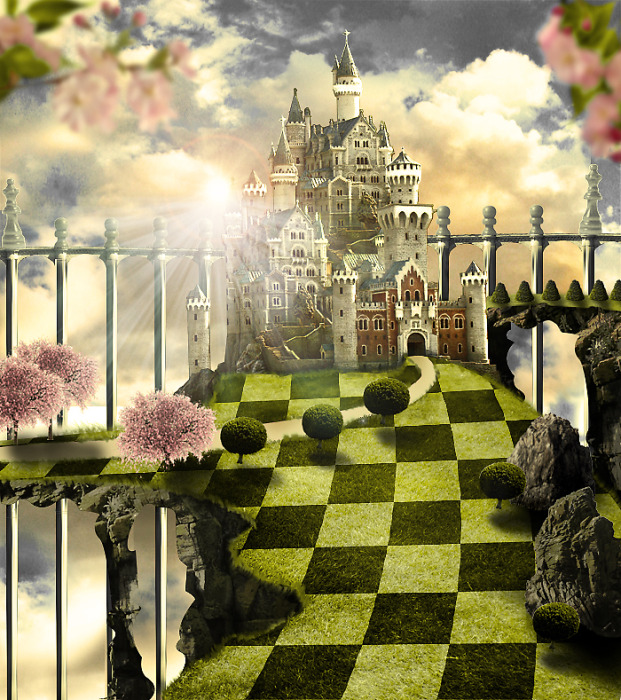 To make the castle look more creative I will add some chess pices like chess pawn and Chess Queen to the bridge; you can add on the castle too. Use adjustment layers like we did for the bridge stock image. Now let's fix the sky area; simply go to the Sky Clouds layer and use the Clone Stamp Tool to fill the empty area. I will also add some cherry blossom trees. Use a Selection Tool and also the Eraser Tool to cutout a few trees. Use a Spatter brush for the blossom area to obtain a realistic cutout. Increase the Saturation a little bit for the cherry trees and also add a cast shadow effect for each tree. In the same way add over the leaves this cherry blossom stock image. You will have to remove the background and to add cherry flowers creatively. Use also the Gaussian Blur filter. So this is the end of the tutorial. All you have to do is add a little light effects; add some rays of light brushes in a new layer. I have used "burst 2" from this set. Also I have added other light effects by using these lens flare brushes. To adjust the color tones you can use a Photo Filter adjustment layer or you can add a Gradient Map with the colors that you want or you can use both. 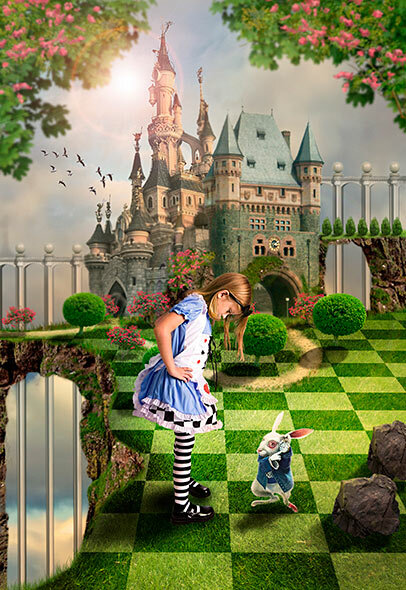 Here is the final result for this fantasy castle photo manipulation inspired by the White Queen Castle from the movie Alice in Wonderland. I hope you've enjoyed this new Adobe Photoshop tutorial and I am as always waiting to see your results! 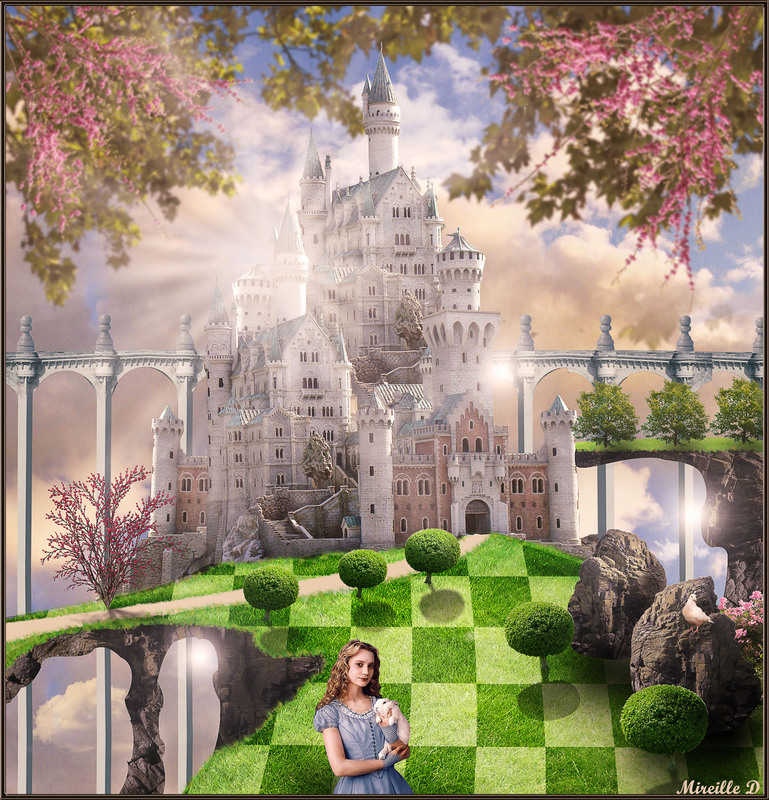 19 comment(s) for "Create a Fantasy Castle in Photoshop Inspired by The Movie Alice in Wonderland"
Thank you for this "wonderful" tutorial! just 1 thing is disturbing me and that is light of the building. Very beautiful! I've just started trying to do it but I don't understand well the step with the pen tool. Could you please give more details about how to draw the grass, rock and road? How can you colour them? Well . I think it looks lovely and quite real with the lights.. I was told once if you have nothing nice to say dont say it.